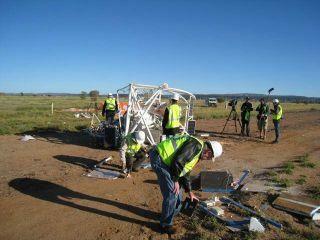 Project personnel inspect damage following a NASA scientific balloon launch mishap on April 28 at the Alice Springs Balloon Launching Center, near the town of Alice Springs, Australia. No injuries were reported. NASA is convening an investigation board. Full Story.